The AHA Heartsaver First Aid CPR AED course provides the knowledge and skills that may help save a life. It also offers the basics of first aid for the most common life-threatening emergencies, covering how to recognize them, how to call for help, and how to perform lifesaving skills. Heartsaver courses from AHA offer: a cohesive, consistent experience for the learner, best practices to give students the best possible learning experience and help them better retain information, enhanced and realistic scenarios, while providing course and content flexibility. Heartsaver courses are intended for Teachers, Fitness Trainers, Security Guards, or anyone with little or no medical training who needs a course completion card for their job, regulatory (e.g., OSHA). These courses can also be taken by anyone who wants to be prepared for an emergency in any setting. 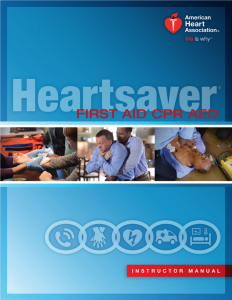 Students that complete the Heartsaver First Aid CPR AED course will receive a Heartsaver First Aid CPR AED course completion card or ecard directly after class that is valid for 2 years. At our training facility in Mission Viejo, California. Child CPR and AED Use. Choking Emergencies in an Adult, Child or Infant. Delivered in 2 formats to meet the needs of students and offer flexibility for instructors. All formats include the same learning objectives and result in the same course completion card. Blended Learning Heartsaver blended courses include an online portion and a hands-on portion. The online portion can be completed at work, at home, or wherever you have internet access. The hands-on skills practice and testing session is conducted in-person with an AHA BLS or Heartsaver Instructor. Review the Calendar to find an appropriate class datetime for a new or a renewal class. Fill out the form: select the class type, datetime, your name, address and contact details. Complete online payment by submitting credit card information on the First Data bank PayEezy page. How does payment work ? The information you provide is used to process payment via credit card. Your email or phone may be used to contact you in case of any issue in class, schedule or payment. A receipt is available on the payment page and also sent via email after processing has completed. Credit Card processing is performed by First Data bank with PayEezy. To provide secure processing, this page redirects to the First Data bank hosted payment system. Choose a Class Date\Time from the Calendar. Lifeline Healthcare Education provides courses for CPR, BLS, ACLS, PALS, NRP, PEARS, and ECG Pharmacology classes in Orange County, California. Copyright Lifeline Healthcare Education. All Rights Reserved © 2018.